The object of basketball is to shoot the big orange ball through the slightly larger circular hoop. 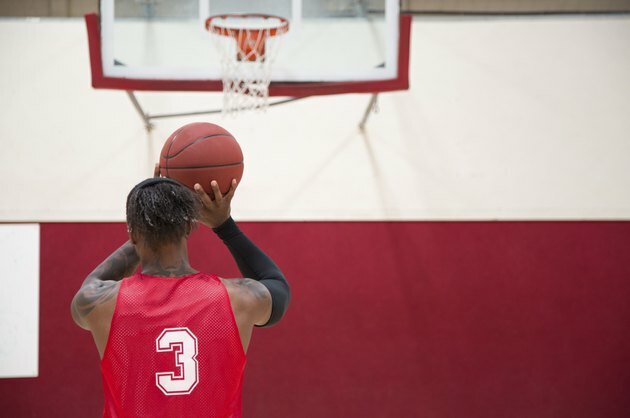 Shooting is one of basketball’s basic skills, and one new players are typically eager to learn. While some players specialize in certain types of shots, all-around players learn as many as possible to maximize their scoring options. Most shots involve similar physical mechanics. Square your shoulders to the basket, place the fingers of your shooting hand under the ball, tuck your elbow close to your body and balance the ball lightly with your non-shooting hand. Extend your shooting arm toward the hoop and flick your wrist to release the shot. Shoot with your fingers and generate most of the power with your wrist, not your arm. Follow through directly toward the target with your shooting hand. You’ll typically aim for a spot above the middle of the rim. From close range, aim for a spot on the backboard. The jumper is used most frequently for mid- to long-range shots, including three-point attempts, although you can use it from short range to gain separation from a defender. Jump straight up and use the basic shooting form. Release the ball at the peak of your jump. The two-handed set shot was once the common way to shoot from the perimeter. Today it’s typically only used by young players who lack the strength to shoot with one hand. A free throw, however, is basically a type of set shot, although it’s almost always performed with one hand. Use the standard shooting form, but don’t jump. You’ll typically shoot layups from very close range after dribbling to the basket, or taking a pass near the hoop. Typical layup form involves grasping the ball with two hands, raising it in front of your face and banking it off the backboard, which all occurs while you’re in motion. A putback of a missed shot is also technically a layup. If you can jump well enough you may also raise the ball as high as possible and flip it straight through the rim. Centers and power forwards who typically operate near the basket often use short shots. A turn-around jumper begins with your back to the basket. You then jump away from the hoop while leaning back and simultaneously pivoting about 180 degrees to face the basket before you shoot. For a hook shot, stride into the lane with your back to the hoop while keeping your torso between the basket and the ball. Turn your non-shooting shoulder toward the hoop, jump, raise the ball straight up and flip your wrist to take the shot. The dunk, basketball’s most spectacular shot, relies more on jumping ability than shooting skill. If you can jump high enough, and hands large enough to control the ball, leap, lift the ball above the rim and push or throw it through the net.